A man was fatally shot by a Chicago Police officer on the city’s Southwest Side Saturday night, authorities said. NBC 5's Emily Florez reports. A man was fatally shot by a Chicago police officer on the city’s Southwest Side Saturday night, authorities said. 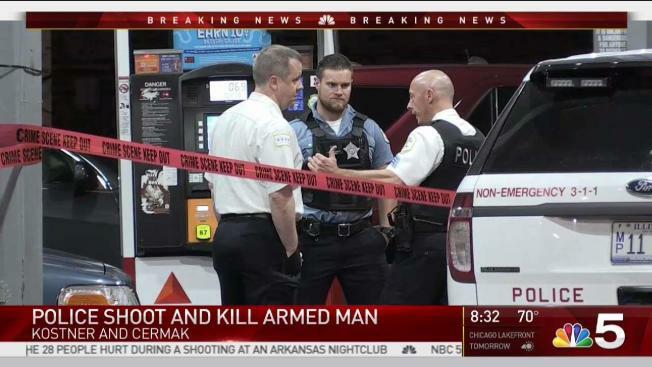 At around 10:45 p.m., officers responded to a call of a person with a gun in the 2200 block of S. Kostner Ave. in the city’s Lawndale neighborhood, Chicago police said in a statement. Upon arrival, authorities said the officers - who were in full uniform and wearing body cameras - went down a gangway to the backyard of a home, where they found an armed man. One of the officers discharged his weapon, according to police, striking the man. He was taken to an area hospital where he was pronounced dead, officials said. The Cook County Medical Examiner’s office could not immediately confirm the fatality, and further details, including his identity, where not available. An officer was also taken to an area hospital for evaluation, where he was treated and released. An AK- 47 assault rifle and handgun were recovered on the scene, according to police. Police accountability advocates spoke on behalf of the man’s family at the scene early Sunday, questioning the department’s narrative. A spokesman for the family said there was an altercation between residents at the scene before the officers arrived, but accused police of using excessive force. “We want them to secure a crime scene, gather witnesses and what we don’t want – we don’t want them to shoot first and ask questions later,” said Eric Russell. The officers involved will be placed on routine administrative duties for 30 days as is customary in police-involved shootings. The incident, including the use of force, remains under investigation by the Independent Police Review Authority.